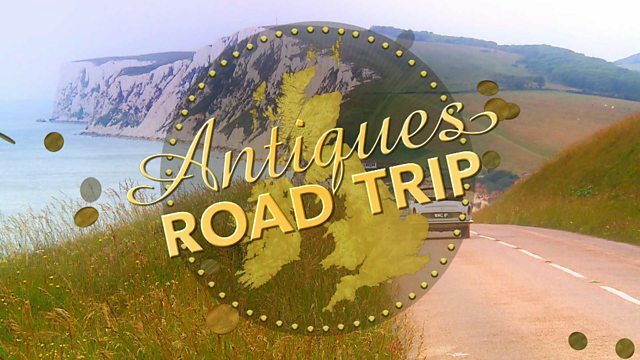 Beginning in Kingsley, Cheshire, antiques experts Phil Serrell and James Braxton head towards an auction in Liverpool on the penultimate leg of their road trip. Browse content similar to Episode 19. Check below for episodes and series from the same categories and more! ..then to make the biggest profit at auction, but it's no mean feat. You are kidding me, oh! or were the slow road to disaster? wrangling for Road Trip supremacy. We're on the homeward run now of our road trip. -I'm going to miss your company. Philip Serrell has discovered the sympathy-card tactic. I'm £100 behind at the minute. -but that doesn't stop him scouting for bargains. It's a king's ransom, isn't it? Our two connoisseurs of all things curio started with £200. but the tables have turned. James now has £335.50 to spend. But Philip's still in the lead, and has £463.30 to put to use today. This being opportune moment just to say that I'm slightly ahead of you? -I think that might verge on gloating. So, what's your plan, James? Are you going to go all in? You got to be tough. You can't...you can't be all smiles in this game. You know, grannies, small children, clear a path. and culminates in Newport, Shropshire. starting in Frodsham, Cheshire, and ending in Liverpool. -Do you like this car? I think it's a bit racy, isn't it? I like the louvered bonnet. Yeah, and a leather belt. It's a fabulous car! is Take That's singer-songwriter, Gary Barlow. We've got the weather of the southeast in the northwest. -And that's what we do for the place, you know? On our road trip, we bring out the sunshine. That's if James can get out of the car. Ooh! Graceful certainly doesn't spring to mind. James's first port of call is the Antiques Emporium. and collectibles, vintage toys and jewellery. Always look up in these places. Look up and look down. Now, there's a powerful image. Barrie A F Clark. A fabulous Spitfire. It seems like looking up has paid off. On a bit of ply. What a strong piece of work. and it's nice and big. That would look stunning in a contemporary flat. I can see it's had a couple of bashes. What's he got on it? I might take it down and see if there's any more damage. Don't do this at home, but it's all right. It's not as bad as I originally thought there. It's a nice bit, that. like he's bought for the last two auctions. from one of the shop's dealers, Anthony Goodband, known as Larry. -It's a good-looking item, isn't it? In a modern interior, it's going to be a nice feature piece, isn't it? Yeah. The boys are going to love it. that you and I might think into the interior. That's right. It depends on how big the garage the boy has to put it in. Could you do something like 28 on it? -We could come down to that, yes, yeah. Larry, you've gone and got yourself a deal. That's fabulous! And James's first item for auction is done and dusted. Here you are. 28. Lovely. Thank you. Bye now. a little spit and polish. Well, a bit of teak wood stain, actually. Well, Patrick's done a fabulous job with that. Great start for James, then. but bound for the small town of Sanbach. The historic market town is known for its Saxon crosses at its heart. forming one of the finest Saxon monuments in Britain. This is just a really, really pretty place, isn't it? Saxon Cross Antiques, run by John Jones. -John, good to see you. following in the footsteps of both his parents and grandparents. So, he should know a good thing or two about antiques. We're going to go to a sale room in Liverpool. I've got exactly what you're looking for. John's got a fine collection of model boats. I would put it at the turn of the century, 1900, 1910. -And what's your ticket price? Ticket price on that is 50, but I can do you a good deal on that. How much is a good deal? 20 quid. All the bits are there, but it's had cat damage. -So, it really is scratch-built. rather than from a kit. But Philip's not committing to it just yet. I quite like this, actually. Look at that. That one's the old Pony Express. And I think it's MOBO. And how much is that? Erm, I've got 75 on that. It's nice that it's not been painted or restored. -When was that made, John? which you've got there with the traditional guns. D Sebel & Co between 1947 and 1972. They specialised in sturdy, steel ride-on toys. So, could you do...could you do 40 for the boat and The Pony Express? and you've got me right down. -Give me five minutes while I just have a think to myself. Philip has over £450 to spend. but Philip's playing hard to get. I think £50 is too much money for the two. I really do. I put that there and I put that there. I think that might act as an encouraging enticement, wouldn't it? Can you help me out at 45 for the two? -You're a gentleman. Thank you very much. Thank you very, very much, indeed. Better get some more money out, hadn't I? and Philip's got his first two items for auction. James is still making his way around the units. -Hello, Rose. Very nice to meet you. the attic here for six years looking after three different rooms. What do you have in here, then, Rose? I'm going to Liverpool, so that's on the Mersey, isn't it? -That might be interesting, that one. -That's a very unusual box, isn't it? Captain. Captain Corbet. What does that say? RN, is it? That's quite nice, isn't it? Nice bit of oak. Navy, oblong, erm, charts, isn't it? Do think it's a chart box? It could be. I thought telescopes, but probably, yeah. I think, Rose, you might have the day. I think it could be a telescope. What could you do on this, Rose? I'm going to be hard on this one. -It's a sort of take... It's a take it or leave it. -That's what you originally thought. I'd love to buy it for 28. He seems to have a thing for £28. I do like it, yeah. What about we meet in the middle? 32, Rose. with an engraved brass plaque, for £32. That's the three, Rose. There's the ten and there's the 20. -Thank you very much, indeed. I think he's miscounted and overpaid. We'll call it £33 then, James. Hmph! also known as the Earls of Stamford since 1736.
in this stately home's history. of the biggest military conflict in its history. return home from battle injured. to care for the wounded. into private military hospitals including Dunham Massey. Katie Taylor looks after its contents. -What a fantastic property, isn't it? was part funded by the Red Cross and part by the Grey family. made by wealthy families for their part in the war effort. so there was a massive shortage. to mark the centenary of the war. This room became the recreation room. those who could get out of bed, would come and eat their meals. That's quite humbling, isn't it? in the makeshift ward here. known as Tommies, a generic term for a common British private. And then you've got all this around you. This place must have been a real change for them, a real surprise. There would have been 25 patients in the former drawing room. for common, wartime illnesses or injuries. introduced in 1916 by orthopaedic surgeon Hugh Owen Thomas. "wound very septic and penetrating." Well, he had a compound fracture, so the wound was open. died from shock, which is fluid loss, blood loss basically. This reduced the mortality rate to just to 7%. -Every war produces different weapons. Means that medical science is always evolving because of conflicts. which has been recreated again today. So, this is a stairwell that's become an operating theatre. which would have been a great spot for people to rinse out bandages. also trained as a voluntary nurse. holding a torch for the doctor whilst he extracted the shrapnel. she would have led if there hadn't been a war. when she was boiling a pan of milk that it would boil over. that lower class girls would have just...would have just known. it was an entirely different world for women like Jane. and the Hall was once more a family home. This has been a really, really memorable trip for me. -And it's a special place. Thanks very much. Thank you. James is still in shopping mode, edging his way east to Romiley. the village of Romiley borders the Peak District. as up until the 19th century, it was predominantly an agricultural area. and Jewellery for 30 years. -Peter, very nice to meet you. So, Peter's giving James some potential pointers. Erm... This barometer... It's quite nice. It's not for me that fellow. Nope. But finally, James's found something himself. Peter, I think this...this is more me. It's got a bit of colour and we got a bit of sea. but it's quite well done and, from afar, that looks quite good. We're going to Liverpool. It's famous for its maritime history. It's actually a Dutch wall plaque, as referenced on the reverse. It's of Texel Island, off Northern Holland. It has a ticket price of £30. -What can we do it for? Can that be cheap? -What would you like to pay for it? -I'd like to pay 15 for it. Can we do it at 15? You can have it for £15. -Peter, I'll take it for £15. And that's James's third item for auction. -Thank you very much, indeed, Peter. I'm pleased with that. Now our gents are done for the day. So, sweet dreams, fellas. as are two antiques professionals step on the gas again. I'm beginning to f...know exactly how sardines feel. that you got in and then they put the roof over you. I couldn't possibly comment on that. Good luck getting out then, fellas. But they've got a lot to do today. on a ride-on horse and model ship. and an oak box for £76. So, they've got a busy shopping day ahead. Nice that they've got the weather for it, though. Talk me through your leaks there. -..that's dribbling down on my right thigh. -I've got one here that's dribbling on my left knee. -I don't want to tell you where that's going. and are looping round the northwest. Next stop is Sale, in Greater Manchester. after a flint arrowhead was discovered by the Victorians. Philip's here to target Manchester Antiques Centre... Ha! Hello, horsey. How are you? ..with Philip you never know. -Good morning to you, sir. -How are you? All right? Blimey! You've got some stockers, haven't you? right around the top of South Africa... South America. South Africa? I used to teach geography! Thankfully, you did give up your day job, then. That's a bit of a fun one, isn't it? It's probably an old Blackthorn stick. They've got a really sweet, little duck or a goose's head on it. Uh-oh! I think he's gone quackers. -It is. How much is that? They've got tears running down them now, John. I think they've got tears. I think I should have asked you what the cheapest thing in the place. -I'll give you a fiver for it. and brand-new, upright pianos can cost several thousand pounds. Second-hand ones, though, are a different market. I can't sell them anymore. -You'll sell that for a fiver? surely are Bechstein and Steinway, are they? -Correct. You can sell a Steinway. -I'm hoping you can sell a Bechstein. Ha-ha! Methinks John could be having the last laugh here. Come on, Phil, I've got something more in your price range. -So, how old's that one do you think? -I'm guessing from the '30s. And has it got any history or...? Well, actually, it's funny you should ask that. -That came out of my mother's garden. -So, I know where it's been for the past 50 years. ..would have been hundreds of pounds, wouldn't it? It would. Yeah, I agree. £280. It's glazed stoneware, so that might be a little steep for Philip. -No. No, I can't do that. -Well, where are you on this, then? I've got to try to buy that for somewhere between 40 and 50 quid. What do you reckon? Would 40, 50 quid buy it, do you think? Come on, Phil! It was his mother's birdbath. Right. £90. Under 100. You can't fail. You can't. No. I can! I can fail. I'll give you my best. -60 quid, and that's me finished. That's a staggering £220 off the asking price. And a piano for a fiver. £65 for the two. in the hope that it makes it more saleable. So, I bought a piano. I bought a water feature. What do you think of that? Not much, eh? way north to the city of Salford. there's been a huge regeneration of Salford Quays. Manchester's unique waterfront is now an arts and culture hub. for the Ground Zero site in New York. Today, James is meeting the museum director, Graham Boxer. -Good morning, James. Nice to meet you. -What a very impressive building. -Oh, it's an amazing building. It's sort of three parts that you can see. the water shard. Three shards of the globe fractured by war and conflict. in January, 1942, to defend the British colony against the Japanese. So, Graham what have we got here? and we can see his initials on here - RMH. when he was in the prison of war camp. he took this with him. and made famous by the film Bridge Over The River Kwai. Around 100,000 died during its creation. but also the poor living conditions and lack of food. -This is the one that he was wearing when he went to Changi. And you can see the width, the circumference of his waist. when he came out six months later. God... It's a child's, isn't it? and how they actually were able to do any work at all. to remember his experiences during the camp. after Japan surrendered in August, 1945. But some prisoners didn't wait for the end of the war to escape. had not one, but two escapes. using entertainment as a decoy. So, these items, Graham, what's their link? Well, these items belong to Oliver Philpot. He was an RAF pilot that was shot down. Philpot was sent to the high-security camp. Along with two other prisoners, he planned his escape meticulously. he would need a cover story to help him reach neutral territory. so he needed to look the part. into the tie all the way along. to actually make this compass for him. and converted them into the compass. The key to the escape was a strategically placed wooden box. whilst hiding in the bottomless box near to the barbed wire. bound for Sweden, then it was easy for him to get back to England. What a great story. So, two objects that aided his flight. -Thank you for coming. Fully enjoyed it. and three daughters, and died aged 80, in 1993.
that you can find at the museum. James is joining Philip back on the road to Ramsbottom, Lancashire. former Prime Minister and founder of the police force, who was born here. So, where is Ramsbottom, James? Erm, Ramsbottom is down there, lad. -We're both in the same shop, are we? -Really? I don't think much about that. I can't see them running for anything. They've got to sort the car out first. This is a bit floppy, mate. -It goes sort of like that. -Let's just leave it be. So, knock yourselves out, fellas! For once, can I be the upstairs man and you be the downstairs man? -OK, go on. Go on. -Don't be too lucky there. -I won't. I'll try hard. and he's hoping dealer Mavis Newton can help him spend it. -Have you got any fresh goods? -Nice things over there in that cabinet. The sticking-out-one, as I call it. what might that truncheon be? Let's have a look, then. Now, a lot of these were ceremonial, weren't they? I think there is some writing on it somewhere. -It's a bit rubbed, isn't it? It is a bit worn, well used. So, you agree it's quite well used and rubbed? It's... Well, it's 100 years old. Not sure your plan's working, Philip. with everyone from kids to grannies? -Can I look at this medal group here? the Atlantic Star and the 45. It's a very nice group. -Can I squeeze you, Mavis? Could you do it for 30? You've gone and got yourself a bargain. Surely, it's the other way around. Upstairs, Philip still rummaging through John's wares. The Short History Of The Lancashire Fusiliers. Oh, yeah, I just got that recently. Yeah, it's quite in. -Oh, I like it this. -Can I have a look at it, please? I just think that's quite a nice little thing. And this is a record of their...just their various actions, isn't it? I'm wondering if I could do a package of that and the truncheon. so if Philip gets them for a good price, he could do well at auction. try and buy it at 40 quid, realistically. Is that going to be any good? -I really don't think I could do it. I'll tell you what, 50 for the two. -I'm going to have the pair of them. and that's him finished for the day. James, meanwhile, is still being ably assisted by Mavis. as pottery figures go, isn't he? -Do you know who the maker is? Got a sort of cutey look, tongue hanging out, isn't he? -Is it all right, Mavis? Is it damaged at all? Condition is key for SylaC figures as damage will devalue them. by Staffordshire ceramics company Shaw and Copestake. Larger figures are generally worth more. about that big and they're not glazed. -They're only small, aren't they? Gina, how much can the dog be? £65. -Can you do it for 30? -I'll take it for 30.
and James's shopping is done. So, let's remind ourselves what they bought. just over a third of his budget again. a truncheon and a military book. And he's only spent £160. Just a third of his budget, too. but what do the chaps think of each other's objects? Phil, the canny fox, has bought well again, hasn't he? I do like his boat, which he's paid little money for. £15. An upright piano...a fiver? Seems cheap to me. I think I bought good items on this one. Let's hope this leg is mine. I think James has been really, really clever with what he's bought. We're going to Merseyside, the waterfront. He's bought that really good Delft plaque with a shipping scene on it. That's going to do well. But the real but is the dog. I think the dog is a dog. If you say so, Philip. I think it's fantastic here. Yeah, look at that! That's the Liver bird, isn't it? Has a great New York feel about it, doesn't it? since the growth of the cotton trade in the 19th century. Now, the boys are on their way to do some trade of their own. that you've got just that little bit of a wavering on? Do you know, Philip, I'm feeling very smug here, but no. That's great. That's made me feel really good. Thanks a bunch, mate. -Bang on trend with prints and sentimental dogs. but we'll soon see as the boys arrive at Cato Crane Auctioneers. That's if they make it inside in time. Holy shmoly! Well, James, here we are. Doesn't get any easier, that. -Ten pounds is... Sorry. Too slow. John's cast an eye over Philip and James's picks. One interesting item is the truncheon. and if we picked up a specialist buyer. One item which might cause a bit of problems is the piano forte. restoration costs must be taken into consideration. I'll be very surprised if we sell it. So, it could be an interesting auction for Philip. How's that piano of yours? Well, rather fortuitously, the rubbish van has just arrived. We'll have to wait and see for that one. As first under the hammer is Philip's ride-on pony. Sh! Concentrate because my horse is coming up. £20 is bid straight in on the internet. It is an internet sort of lot, isn't it, Phil? 30 on the internet. 35 is bid now in the room, standing. All done at £35, your bid, sir. Just breaking even. Washes its face, that one. Just a fiver profit for Philip's first item. £20 to start me off. Commission bid of 20. £20 is bid. -20? Is that the best we can do? £20. It's a nice thing. £20. Make it 22 somebody. £26 is bid. I'm going to sell. I'd like a little more, really. -So would I...if you put it that way. cos I thought that was going to make £50 to £80. Shut him up, didn't it? But £11 profit is a good start to closing in on Philip's lead. Next, it's Philip's model ship. -I'll take 25 to start you off. -25 is bid. 30 over there. The lady's bid over there at £30. I'm going to sell at £30 now. All done at 30. It's your bid, madam. £30. That's not bad, is it? Take what you can get, fellas. -We're not going to walk out of here with bulging pockets, are we? could entice a specialist militaria buyer. What do you think you might get? I don't know. £50, £60. 20 is bid over there. 20. 25. Thank you, I'll get internet in a second. 25. 30, sir. 35 with you, sir. 35. 40 at the back. 45 on the internet. Any further bid in the room, now? 50 is bid in again. Thank you, sir. £50 is bid. and that's £20 profit to help inch closer to Philip. He's taken a gamble by removing the broken base. "then I would have been all over that like a rash." You're really bitter this morning, aren't you? Very, very bitter. I can start the bidding at 30, and 30 is bid. -We've got two bidders on the internet now. -45 on the internet now. -Do they know it's not going to go in an envelope? That's enough I think, isn't it? Oops! Philip's gamble hasn't paid off. He's ended up with a ten pound loss. -That's a relief, that is. -It could've been a lot worse. James is up next with his SylvaC dog figurine. Look at that. This is lovely. Start me at ten pounds on the SylvaC terrier. Ten is bid over there. Ten. 12, the gentleman here. 14. 16. First bit of bidding I've seen in the room. -This is bidding in the room. -£44, right in front of me here. I can feel you creeping up behind me. And another profit for James. Watch out, Philip! the antique truncheon and military book. -When we say on it? £20 to start me out. 20 is bid. 25. 30. -35. Worth a bit more than that, I think, isn't it? 40 on the internet now. -42. 44 on the internet. I'm getting worried now, Philip. Well done. Well done. -46 is bid in the room. 48 on the internet. Do you want to round it up to 50, madam? 48 on the internet. It could've been worse, couldn't it? -That could have been like Armageddon. Philip could be losing his grip. It's his second loss today. Now, it's over to James's beloved Spitfire print. God, I do love my Spitfire. What do you think? -God, do you know? I'd buy that. -£20 to start me off, come on. Anybody? 20 it's a nice thing. £20 is bid. Anybody else? 25, Mr Berry. -Oh, you're off to the races. £28 with you. 29 now. -£30. 31 will do another one. £32. Why waste the bids? Take it up in fives, chief. You happy with that now, Mr Berry? £32 then. We're going, Berry. And that's another profit for James. He's now got one last chance to try and get the edge on Philip. could do well in the port of Liverpool. -If this makes 100 quid, I'm in trouble. What about, erm, £20 to start me off. 25? 25. 30 with you, sir. 30? £30. -No, keep going at £30. All done and finished, ladies and gentlemen. £30. What a crying shame to sell something like that for £30. -I got out of jail there, didn't I? but Philip's final item, the piano, is a potential winner. if it makes good money. If that Joanna makes 100 quid, I'm stuffed. Who would have thought be able to buy a Bechstein at five pounds? And then be worried that you might not make a profit on it. -That's the real bonkers bit, and I might not. and you'll have a very, very fine instrument. Come on. £50. £20 if you like. -I'll give you ten, Mr Crane. -Ten pounds your way. That's profit, chief. It's worth a lot more than that, I think. Ten. -It needs a lot of restoration. -Can you give me 20 for it? -15... Is that your best bid? And I'm doing you a favour. -The man's clearly an expert, isn't he? -Any further bid anywhere else? All done? I think you're the proud owner of a Bechstein piano, sir. That's not bad. At least you've a bit of profit there, chief. -it was a real gamble taking it on, wasn't it? leaving him with £449.26 for next time. bumping his budget to £348.74. But Philip's retained the lead. So, it's all to play for in the final leg. Start the car. Well, you've narrowed the gap. I have narrowed the gap, but I expected to do more narrowing. -I'll drive. Go on, good man. Cheerio till next time, fellas. Next time, it's all getting very sentimental on the final leg. -And you've been my little ray of sunshine. ..while James finds himself in a tight spot. Do you want a lift out? so I got no sort of core strength. Beginning in Kingsley, Cheshire, antiques experts Phil Serrell and James Braxton head towards an auction in Liverpool on the penultimate leg of their road trip. Phil has a commanding lead, but can James find a way back into the competition before the experts enter their fifth and final leg?